WILHELM Mrs. Lucille Wilhelm, age 60, beloved wife of 32 years to Bernard C. Wilhelm of Milford, passed away on Monday, December 08, 2008 in CT Hospice, Branford. 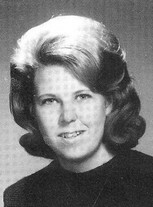 Daughter of the late Ren and Annette LaPointe Gosselin, she was born on December 15, 1947 in Meriden. Lucille was an Administrator at Vishay in Shelton. She enjoyed quilting. She was very active in the St. Ann Church Community, where she sang in the Choir, founded the Parish Shawl Ministries Group, and helped coordinate baby showers for unwed mothers. In addition to her husband, she leaves four daughters, Danielle Bourque of Milford, Linda Doherty of New York, Debbie Siraco of East Lyme, and Kelly Potter of East Granby; and three sons, John Wilhelm, James Wilhelm, and Stephen Wilhelm, all of Milford. He is also survived by 13 grandchildren, three great-grandchildren; and a brother, Leonard Gosselin of Vernon.